Available from the Amazon Kindle store ﻿ (US)﻿ (UK) & all Amazon sites. A collection of nine romantic short stories set in glamorous locations from Italy to the Caribbean, passing through Scotland and Santa Barbara. Culture clashes, accidents, adversity, and career demands are some of the obstacles that conspire to keep our couples apart. But love conquers all in these upbeat fairy tales for grown-ups. For those who are intrigued by intersecting worlds, one of the couples from Riding plays an interesting cameo role in my new book "Kyle Harrison Movie Star". Another couple from a different story will make an appearance in the third book in the "Kyle in Hollywood" series, which I am currently sweating over. This is my first collection which contains nine short stories (three are novellettas) and a set of photographs taken on my travels. Villa d'Este: A handsome TV personality is bewitched by a mysterious young beauty. Barra: A remote Scottish island casts its spell on a troubled American movie star. Rain in Rome: The slippery slope of love in the Eternal City. Montmartre: He pitched his song in Paris and found he made a hit. Amalfi Coast: Poor but hopeful, two young lovers find joy and upset on the beaches of Southern Italy. Amsterdam: Walking home from his night-shift through the red light district, the last thing he expected was an offer of eggs and coffee. Tobago – Having Lost The Boy: Down and out on a tropical beach, there was one more thing he could salvage. Book Trailer for "Riding a Strong Wind"
Just completed my first YouTube book trailer video for Riding a Strong Wind. It was fun doing the narration and then turning the whole project over to my video editor who, I think, has done an excellent job. In fact, she has now created a new and improved version. I'd be delighted if you could take a look, and it would be great to have your comments, if you care to. Hope you like it! 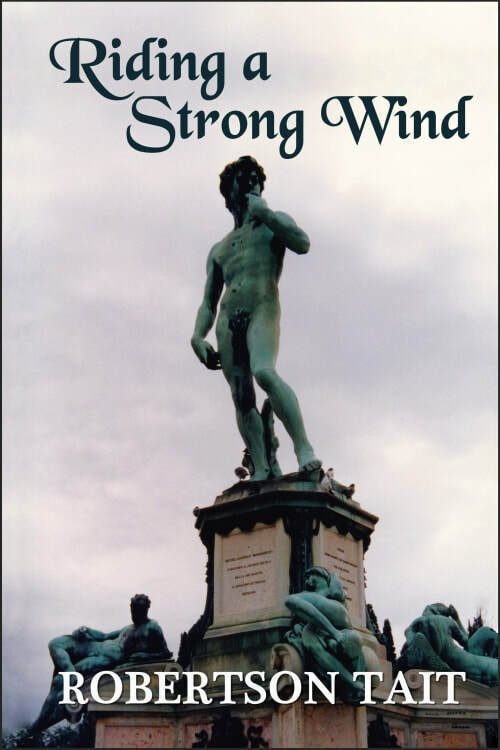 My collection of short stories "Riding a Strong Wind" is receiving a little attention. Read my Author Interview on Mrs. Mommy Booknerd's literary blog dated September 22, 2016. The interview was a lot of fun and made me focus on the subliminal aspect of the writing process.